Marlene A. Pontrelli is a certified specialist in family law. Her practice focuses on all aspects of family law including dissolution and legal separation of marriage, business valuations, division of property, spousal support, post-dissolution modifications, premarital and post-marital agreements, paternity, child custody, parenting time, and child support matters. She is admitted to practice in California and Arizona. She also acts as a private mediator for parties wishing to settle outside the traditional court process. Ms. Pontrelli is an adjunct professor at the Sandra Day O’Connor School of Law where she teaches the family law class. 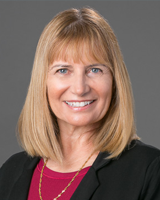 She has extensive trial and appellate experience including appearing before the Arizona Court of Appeals, Arizona Supreme Court and Ninth Circuit Court of Appeals. Ms. Pontrelli has written several books, including Divorce in Arizona, Daily Meditations for Healing from Divorce, and the recently published Family Law in Focus, She is a frequent lecturer in the area of family law and has conducted workshops throughout the country on time management and balancing work and personal life. The Family Law team at Dickinson Wright is among the most experienced and respected. Most of the team’s lawyers are certified family law specialists and together possess more than 100 years of combined experience. Practicing throughout the U.S., we have developed the largest domestic relations practice in the State of Arizona. We help our clients with the full range of domestic relations issues, including: divorce, child custody and parenting time, pre-marital and postnuptial agreements, cohabitation agreements, spousal maintenance and child support, paternity and interstate and international family law matters. We are particularly experienced in resolving business and professional valuation disputes. Our objective is always to help our clients solve problems, not create or exacerbate them. Whenever possible, we encourage out-of-court settlements. Our experience shows that most contested cases can be settled effectively in this way. When litigation is necessary, however, our clients benefit from our team’s extensive experience in state courts and in private mediation and arbitration as well as the resources of a full-service law firm. In complex divorce cases, our clients can rest assured that our team has in-depth knowledge of the laws related to child custody and property issues as well as all related areas of law. These include tax, pension and retirement funds, estate planning and probate, bankruptcy law, business and corporate matters and tort litigation. Dickinson Wright serves our clients from offices in Detroit, Troy, Grand Rapids, Ann Arbor, Lansing, and Saginaw, Michigan; Austin, Texas; Columbus, Ohio, Ft. Lauderdale, Florida; Las Vegas, Nevada; Lexington, Kentucky; Nashville, Tennessee; Phoenix, Arizona; Reno, Nevada; Washington, D.C. and Toronto, Ontario. And, our affiliations with leading law firms throughout the world provide us with global reach.